White Nightgown - Whether you’re looking for something romantic, practical, cozy, or anywhere in between, we’re willing to bet there’s a nightgown that’s perfect for you. White nighties are the sleepwear solution for any time you want to look chic, feel relaxed, and make bedtime feel like a luxury. Here are our top 10 reasons to love this popular nightwear style. Few things feel more tranquil and soothing than crisp white bed sheets and linens, so steal that same experience for your sleepwear. Choosing a white nightgown instantly gives you a fresh and clean sensation that many people find ultra relaxing. White is airy and fresh in the hot summer months, and cozy and inviting when it’s cold outside. 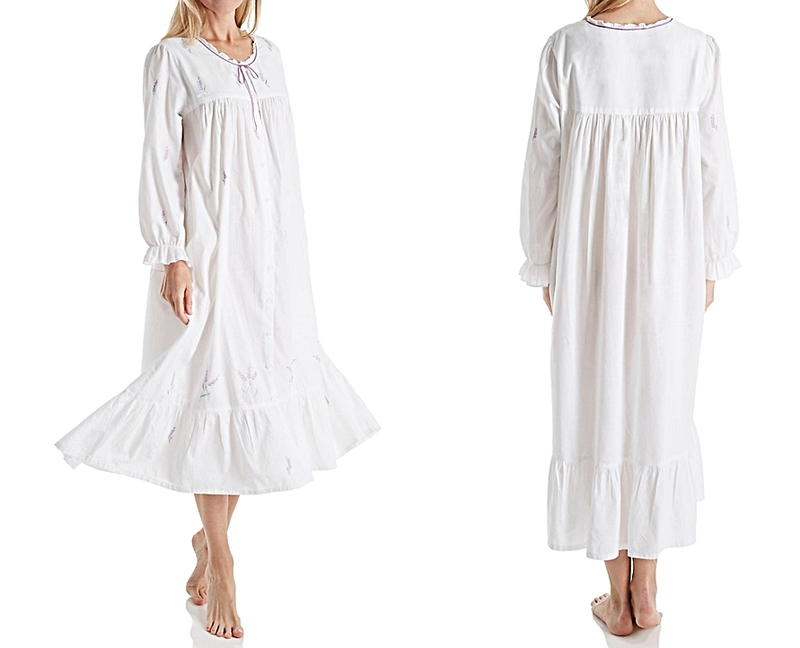 Breezy white cotton nightgowns are the perfect summertime pieces, while a white flannel nightshirt is a perfect choice for staying warm on a winter’s eve. Cotton sleepwear styles and sizes can vary a lot. Always take the time to try on any night gowns or sleepwear to avoid disappointment. The seasons “it” shades will come and go and can quickly look dated, but white is always just right because it's so timeless. This shade is a classic choice for a nightgown or any kind of nite wear or lingerie that will look stunning now and 5 years from now. You’ll never regret the enduring elegance of white sleepwear. Let’s face it, wearing white during the day means avoiding a minefield of stains, from ink, to coffee, to children’s sticky fingerprints. Bedtime is the perfect time to slip into a nightgown that's lovely and white and enjoy its easy pristine quality, without worrying about spills and stains. White nightgowns have their place in history, from classic Victorian dressing gowns, to romantic bridal style, to Elizabeth Taylor smoldering in a white slip in Butterfield 8. When you wear a white night gown you’re joining the ranks of iconic style in a seemingly simple looks that’s full of panache. Not only does a white nightgown give you a sweet and innocent appearance that we all love, but it can also give us a feeling of mental lightness and ease too. White sleepwear looks beautiful in any fabric or style. White lace, flannel, cashmere, jersey knits, chiffon, and silk. The options are endless when it comes to all of the luxurious materials that look and feel amazing in clean, pure white. Trying to pair different pieces in shades of blue or pink or lavender rarely results in a perfect match. That’s the beauty of white – it mixes seamlessly in with your other sleepwear pieces. Wear a white nightie with a white robe that you’ve had for years and it becomes an instant set. Or pair a white nightgown with colored pieces from your lingerie drawer and watch colors pop against its clean backdrop. Look around you next time you’re at the spa and you’ll notice that the towels, robes, and other linens are all white. The surroundings and décor are minimal, and are also often white or soft neutrals. The reason for this? White gives us of a blank canvas; calming and free of any of the visual noise of our daily environment. Relaxation and escape can be found right in your own bedroom, and is as easy as slipping into a beautiful white nightgown.